One of the main purposes for beginning Puremusic five years ago was to bring to greater exposure great artists lingering or thriving in the non-corporate shadow. The next big shadow came from the non-corporate world itself. Affordable recording and the Internet's mechanism for theoretically marketing one's self has created a lethal bottleneck in the indie musical world, congested too often by acts much more adept at booking and relentless self-promotion than they are at music itself. When you add this congestion of mediocrity to the onslaught of computers, videos, the meteoric rise of gaming and the global love affair with the Internet, it's small wonder that the music business and especially live music finds itself in a perilous predicament. Some superlative artists we know continue to make records and do some touring, but without putting too many eggs in that basket, and this will surely be a growing trend. For many, the biggest question will be at what point they make that turn, and what alternatives for mental, spiritual and fiscal survival present themselves. 'Twas ever thus, really, but these are the latest twists in an age old story. Joy Eden Harrison is a great artist that we ran into some years back. 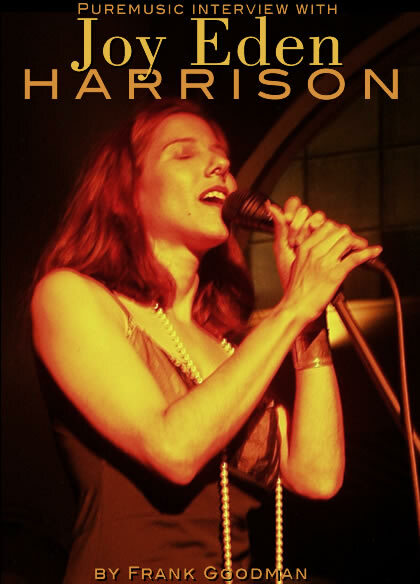 We were very taken with her CD Unspoken in 2003, and it went on to win her the Best Jazz Artist for that year by the Independent Music Awards, with some very distinguished judges on the panel. But the praise arrived at the same time as the walls the artist was beginning to run into. Joy's search for equanimity led to teaching school, and continuing to play and write, but to ease off it for a while and strike a new balance. She is a very singular voice of unique allure, as a writer and a singer. Her story is colorful, and her presence compelling, personally and artistically. Her new record, Blue Venus, blends the jazzy atmosphere of her previous work with ambient and electronic influences that open up the top end of the sound beautifully. We're big fans of this artist, and encourage you to check out the clips on the Listen page, as well as the clips of Unspoken, also linked at the end of the interview.